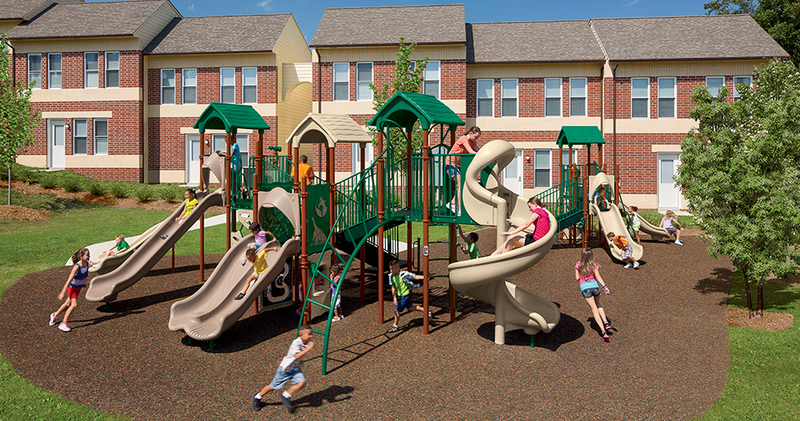 Adding a playground to an existing or new apartment complex provides numerous benefits. Not only does an apartment complex playground provide an outdoor gathering place for your residents, it also enhances the sense of community as well as the desirability of your property. Explore Playworld’s diverse playground options, analyze our pricing structure and let us help you make your apartment complex a more fun place to live for your community’s children. Playworld designs and constructs each and every playground with durability and accessibility in mind, and each are fully compliant with ADA guidelines and are built with the strongest, most durable sustainable materials available. Because we believe details matter, we build our playgrounds right here in America using Earth-friendly production practices. Our passion for play — and our belief that people of all ages and abilities should enjoy the playground — is evident in each and every structure we design. Our suite of products includes playgrounds and freestanding structures suitable for children and adults ages 2 and up. Our structures feature multiple challenges, raised areas, slides, bridges, balance activities and more. We’ve designed an innovative electronic playground that’s unlike any other in the industry. Residents who are developmentally challenged can easily navigate our structures, and our surfaces protect your community as well as your investment. We also manufacture comfortable, high-quality furnishings, so caregivers and guests can relax long after children continue playing. Simply put, Playworld has your needs covered. As a leading provider of playground equipment to schools, towns, businesses, organizations and others, we understand that every project has a budget. Playworld makes it easy to stay within yours by providing easy, up-front pricing suitable for a wide range of budgets. We can help you furnish the largest brand-new playground or refresh an older, smaller play space — explore our diverse play equipment options and pricing structures and see what’s right for your apartment complex. When you partner with Playworld you’ll not only enhance your apartment complex, but you’ll also create a closer community. Contact us and find out how we can help you add value to your property with our durable, American-made playgrounds today.